Property 9: Bungalow in quietly located holiday park. Nice holiday apartment in the heart of Styria. At the feet of Greims i .. !!!! 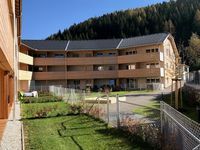 Property 10: Nice holiday apartment in the heart of Styria. At the feet of Greims i .. !!!! Apartments for man and dog high on the mountain with private bathing pond. Property 12: Apartments for man and dog high on the mountain with private bathing pond. Property 23: 0 bedroom accommodation in St.Georgen am Kreischb. Property 25: 1 bedroom accommodation in St.Georgen A.Kreischb. Property 26: 2 bedroom accommodation in St.Georgen A.Kreischb. The whole my family is delighted with our winter vacation in Lungau residence apartment. All our overall impressions are fantastic. Fast communication, detaild access instructions makes, quiet surroundings. Spacious, comforetable, modern and very clean apartment. Equipped with everything needed for even longer stay than one week , from small kitchen accessories and devices to washin machine, drier... Undergroud garage was very useful due to the lot of snow falls. Lot of wniter sports in neigborhood, skiing areas in 10-15 minutes distance, cross country trail in less than 5 minutes by car. We spent fantastic skiing week in Lungau, we'll come back next Year.